IPS Correspondent Tharanga Yakupitiyage talks to AMBASSADOR MASUD BIN MOMEN, permanent representative of Bangladesh to the U.N about the Rohingya' crisis. 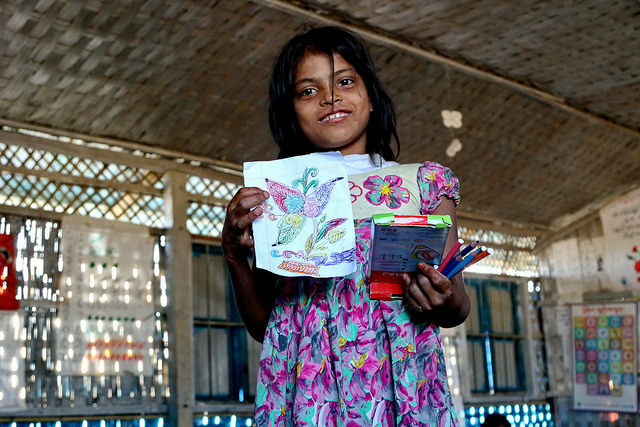 UNITED NATIONS, Sep 26 2018 (IPS) - Over one year ago, Bangladesh opened its doors in response to what is now the world’s fastest growing refugee crisis. But questions still remain on how to rehabilitate the steadily growing population. After a military crackdown on suspected terrorists in August 2017, over 700,000 Rohingya fled from their homes in Rakhine State, Myanmar to Bangladesh, bringing with them stories of the horrors they have experienced. The United Nations described the military offensive as a “textbook example of ethnic cleansing” and a recent fact-finding mission called for the investigation and prosecution of top officials from Myanmar’s military for possible crimes of genocide. 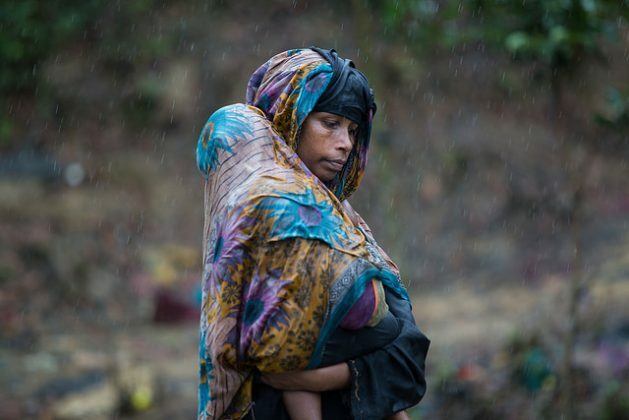 However, recurring cycles of violence can be traced back to 1978 and now 1.3 million Rohingya reside in Bangladesh, leaving the small South Asian nation straining for resources to provide to grief-stricken refugees and overcrowded camps. So far, only one third of the humanitarian appeal for refugees and local host communities have been met and still many challenges remain from environmental stress to trafficking to the lack of shelters. Bangladesh’s prime minister Sheikh Hasina, who was in Time Magazine’s list of 100 most influential people of 2018, has been lauded for her humanitarian gesture and her government’s work in addressing the crisis. Many international and national organizations are working to support the Rohingya refugees. The International Organization for Migration (IOM) in particular and its head William Lacy Swing have worked relentlessly to not only provide support to the refugees but also to find a lasting solution to the crisis. Swing has worked closely with the prime minister and her government and engaged with the many parties involved to bring about an end to the tragedy. In recognition of his untiring efforts, Inter Press Service (IPS) is honouring Swing with the Person of the Year Award at an event to be held at the U.N. headquarters on Sept. 27. The prime minster will receive the IPS U.N. North America’s Humanitarian Award for her decision to give shelter to the over one million Rohingya refugees who were driven out of their homes, tortured, burnt, raped and left stateless and hopeless. Ahead of the Hasina’s speech to the U.N. General Assembly, which is expected to focus on the Rohingya crisis and call for international action to resolve the crisis, IPS spoke to ambassador Masud Bin Momen, permanent representative of Bangladesh to the U.N.about the ongoing challenges, support, and future action plans. Inter Press Service (IPS): Could you talk about the situation in Bangladesh—are refugees still arriving? What conditions are Rohingya refugees arriving in and what conditions are they seeing and living with in Bangladesh? Masud Bin Momen (MBM): The situation in Cox’s Bazar is terrible. Having to shelter more than 700,000 Rohingyas from Myanmar’s Rakhine state, which is the fastest-growing crisis of its kind in the world, and provide them with humanitarian support is an onerous responsibility. It was the bold decision of our honourable prime minister to take up such a huge responsibility responding to humanity’s call. It takes a lot of courage and magnanimity of heart to make such a politically sensitive decision. And the influx of Rohingyas has not stopped. It is continuing although in much smaller numbers. The freshly-arrived Rohingyas are still giving a grim picture of the ground situation in the Rakhine state. They are telling us about insecurity, threat, persecution, hunger, lack of livelihood opportunities, which is forcing them to leave Myanmar. IPS: What has the government been doing as of late with regards to supporting Rohingya refugees there now? What have been some of the challenges to support these refugees? MBM: The camp conditions in Cox’s Bazar may not be perfect and surely, one would understand how difficult it is for a developing country to cater to the humanitarian needs of such a huge population. But our government is trying its best to further improve the camp conditions to ensure basic necessities of the Rohingyas. The challenges are manifold, I would mention only a few. Providing them with the basic amenities has been the biggest challenge. For firewood, the Rohingyas have destroyed the forest and vegetation around the camps creating serious threat to the ecology of the area. The shelters that they have built on the slope of the hills are vulnerable to landslide during the monsoon. For livelihood they are competing with the locals. This is reducing employment opportunities of the local population thus creating concern among the host communities. Their presence is affecting the local law and order situation. The possibility of radicalisation looms large. As their stay lingers, there is the possibility of mingling with the local population which could make their repatriation more difficult. IPS: Could you talk about the controversies surrounding repatriation? Why has it been stalled, and are conditions favourable or safe for Rohingya refugees to go back to Myanmar right now? MBM: Although Rohingyas want to return to their homes in Rakhine they would not return to Myanmar until and unless the ground condition in the Rakhine state is conducive for their return. This is the singular impediment to return. Improving ground conditions is entirely Myanmar’s responsibility. Since the ground condition is not yet conducive, the Rohingyas are not signing the declaration for voluntary return and hence repatriation is being delayed. IPS: If refugees cannot return to Myanmar yet, what does Bangladesh plan to do with regards to support? Are there future actions planned to enhance camps and living conditions? MBM: If they do not return in the foreseeable future we perhaps have no other option but to continue to give them refuge. We would not send them back against their will. As our prime minister said, we would share our meals with them (Rohingyas). There cannot be a more poignant message of our goodwill to the Rohingyas. Our government is relentlessly working to improve the camps and the living conditions therein. We are also developing an island for relocation of some of the Rohingyas. IPS: What are your thoughts to the criticism that the island which you mentioned is not safe to live, particularly due to violent weather and high risk of floods? MBM: This is an entirely wrong perception. Keeping the entire Rohingya population in a geo-politically sensitive place like Cox’s Bazar is not feasible at all. Cox’s Bazar simply does not have the physical capacity or the infrastructure to sustain such a huge Rohingya population. So, they have to be relocated and the island you are talking about is one such place for possible relocation. Initially about 100,000 Rohingyas are planned to be relocated. The criticism that you have referred to is baseless coming from ill-informed quarters. Our government is working hard to make the island livable with self-sustaining livelihood options. And until it is made entirely livable, Rohingyas are not going to be relocated there. IPS: What are your thoughts on the International Criminal Court (ICC) launching a preliminary examination? MBM: We feel that this is a positive development in ensuring accountability of the perpetrators. If the ICC can come up with some concrete outcome, it might also serve as an important factor in building confidence among the Rohingyas which will facilitate their repatriation. IPS: Do you have a response or message to Myanmar’s government regarding the crisis? And perhaps a message to the International community in addressing the situation? MBM: We would urge upon Myanmar to make ground conditions in the Rakhine state conducive for return and take back the Rohingyas as soon as possible. The comprehensive implementation of the Kofi Annan Commission’s recommendations would be able to address the root causes of the Rohingyarians. We urge upon the international community is to take custodianship of the bilateral arrangements for return that Bangladesh and Myanmar have signed and impress upon Myanmar to take back the Rohingyas.